Everything you need to serve two inspired cocktails. Each set contains 2 carefully crafted Rocks/Old Fashioned tumblers and 2 molds for large slow melting ice spheres. Handmade and handsome, The Franklin is crafted by hand from lead-free crystal giving it understated elegance. Its heavy base, fine seamless glass with mesmerizing reflective patterns are its' signature. The Franklin works great for sipping whiskey neat or on the rocks. 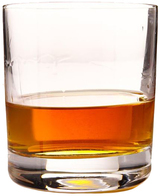 The classic round shape makes it ideal for stirring a cocktail directly in the glass. Dishwasher safe and made of luxurious crystal. Glasses measure 3.5" tall and have a 10 oz capacity.